The UV disinfection industry has experienced tremendous growth over the last 20 years. The development of new UV technologies over this period is a perfect example of an industry investing to meet market demand – in this case demand for an effective, low cost, and environmentally friendly disinfection technology. The acceptance of UV disinfection at water plants treating in excess of one billion gallons daily is proof that UV is no longer an ‘emerging’ technology, but rather an accepted technology to be used routinely by engineers to safeguard human health. The UV industry continues to change, grow and invent new products and applications. This article briefly explores some of the emerging trends. Virtually all of the leading innovative, entrepreneurial UV companies have now been acquired by major, multi-product, financially mature industrial groups such as Danaher, Halma, Siemens, ITT and Suez. This has induced market stability and, whilst this will ensure highly professional product offerings and delivery, it also means that many of these newly acquired companies must either become or remain profitable to justify the investment made in them. The regulatory acceptance of UV for treating drinking water (particularly in the USA) and regulatory standards for validating new UV reactor designs all signal a major shift in the acceptance of the technology into the mainstream. The UV industry has experienced double digit sales growth over the last 20 years, and combined annual sales of UV products will soon be in excess of $500M. The formation of the International Ultraviolet Association (IUVA) in 1999 provides a forum for information dissemination and self-regulation, and the imminent USEPA UV Disinfection Guidance Manual to assist engineers and owners in the design, operation and maintenance of UV systems will further standardize the use of UV. The use of computational fluid dynamics modeling has vastly improved manufacturers’ ability to predict with confidence the level of treatment required for unique waters using their proprietary equipment. System sizing is no longer a black art, as the selected manufacturer can work with the design engineer to accurately predict treatment levels under varying conditions of water quality and flow. All UV equipment manufacturers will soon use this tool to optimize the dose delivery of their reactors and minimize energy costs. As manufacturers develop and improve optimized reactors, they will then validate the designs using USEPA or European validation protocols. These optimized reactors will be rolled out over the next several years. Conventional UV lamp technology will also improve. Medium pressure lamps will continue to see gains in energy efficiency, lamp life and power density, with Quartz coating techniques extending lamp life to well over 12000 hours. This approach will remain favored for compact, small footprint installations, particularly retrofit, or where automated wiping is required. Low pressure, high output lamps will also have increasing power, perhaps approaching 1kW, which will decrease the footprint and maintenance requirements for systems using this technology. Lamp disposal will emerge as a significant issue for low pressure UV installations which use many thousands of low pressure lamps. New UV lamp sources such as light emitting diodes (LEDs) claim to be a technology of the future. The advantages of LEDs are their ability to concentrate virtually all of the electrical power into a very narrow bandwidth of 260 nm to 262 nm, their vastly superior power efficiencies, a very long lamp life (reported to be greater than 100,000 hours) and, because of their point-source nature, they are not restricted to conventional cylindrical designs. Likely drawbacks of this promising technology will be in the power supply drives for the lamps, which remain largely in the concept phase. Other lamp types such as excimer lamps show some advantages, such as being mercury free and having no warm-up time, but are currently limited by low power efficiency and high ballast costs. The excimers are often also more toxic than the elements they propose to replace. Another interesting technology involves the use of microwaves to energize a UV lamp without the use of electrodes. Developers claim to have produced power outputs of up to 1000 W with similar UV outputs to low pressure lamps, which would dramatically improve the footprint and maintenance of low pressure lamp-based systems. The absence of electrodes also greatly increases the lamp life. This development could well see microwave power supply emerge as the consumable, with the lamp remaining in situ for 4-5 years. The long term effects of using microwaves on sleeve wipers remains unknown. UV sensor technology has also greatly improved over the last decade, with stable, reliable and germicidally accurate sensors now available and a well regulated calibration protocol now in place. In addition, manufacturers have improved the proprietary control systems for taking information from the sensors, flow meters and other monitoring devices and using this information to optimize the performance of their equipment. They can also interface with the operator at a plant’s control center. The D10 values* of more and more microorganisms is now known, with the list growing all the time. Most notably, research has confirmed the very low doses required to disinfect Cryptosporidium and Giardia, while also finding several viruses that have an unusually high D10. As new applications for UV are found, new microbes will be added to existing D10 tables. A major concern to the UV industry is the issue of reactivation – the apparent ability of some microorganisms to repair the damage done to their DNA by UV, reactivating their ability to infect. DNA repair can occur in a closed (dark) system, but is more likely in open systems under direct sunlight (pho6toreactivation). The dose level and lamp type seem to affect the degree of reactivation, with low pressure (single wavelength) UV lamps appearing to be more susceptible to photoreactivation than medium pressure (multi-wavelength) lamps. A much larger research effort into the area of photoreactivation is required and will most likely be forthcoming over the next 5 years. A significant amount of research has also targeted the question of UV disinfection by-products, specifically the most common water constituents such as chlorine, bromide, nitrate, ozone, NOM**, and iron. At normal UV disinfection doses no significant disinfection by-products have been shown to form. Research continues with more exotic water constituents. Modern lamps add to the distinct style to any room of the house. You can find them in a multitude of sizes, shapes, and finishes to compliment any room. No matter where you need additional lighting, you can find a lamp that is perfect for your situation. 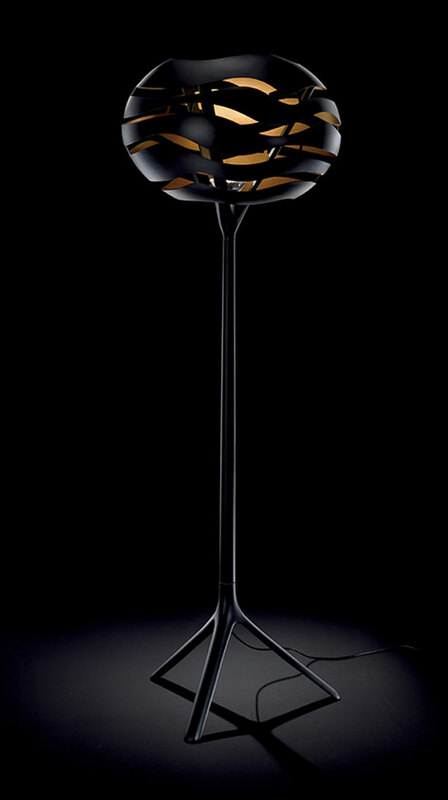 You can use a lamp to make an artistic statement as well as being functional. That is the beauty of these modern fixtures. 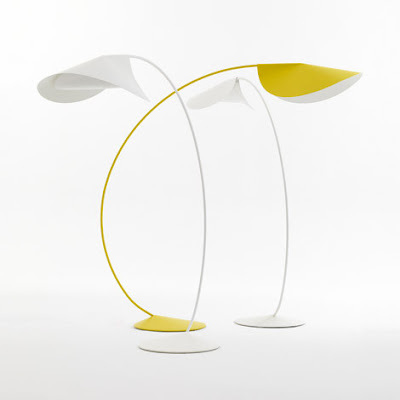 The Shio lamps was designed by Arturo Alvarez and are constructed using laminated wood boards, placed side-by-side and filtering the light through its spaces.Available in white or yellow finishes, the Shio comes as a table lamp, floor lamp, wall lamp and in two sizes of suspension lamp. 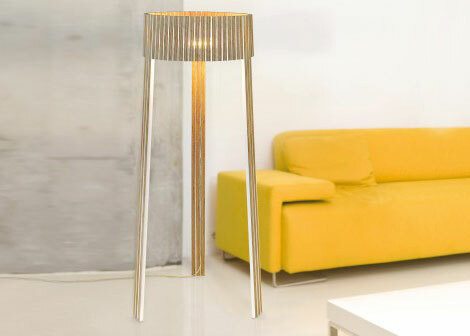 Stylish Floor Lamp With Wave Lighting Effects The Tree Floor lamp comes from a Spanish company Dab. This stylish floor lamp was designed by Werner Aisslinger and features a solid shade that is artfully sliced to allow light to permeate and illuminate the room.The Tree Floor Lamp is available in two sizes: 55 and 65 cm, i`m sure that can be integrated in any room to crate some light waves. 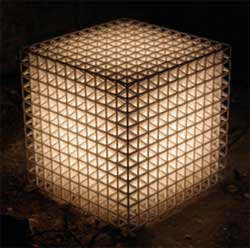 This cube light from Freedom of Creation would look sweet in my living room. Well, actually it’d look better than most of the stuff in my living room, but I can live with that. According to the company, the Cube is “created to remind us of the architecture of products” and the interesting lamp is “developed to be a sculptural piece as much as a soft light.” (I just like it because it’s square.) The Cube lamp is about 8″ high and wide, and the light bulb gets installed in a hollow in the center that’s accessible from the bottom of the lamp. As we are know, LED technology is instead of traditional illumination now. The benefits of using LED have also had an impact on the consumers who are now switching to these lights than the conventional light bulbs. Besides, home and office, the traffic signals, port headlamps and flashlights are too using this inexpensive LED technology for better and eco friendly illumination. In the lighting industry, LED lighting is known to be representing a fundamental difference in the use of electrical energy for illumination. 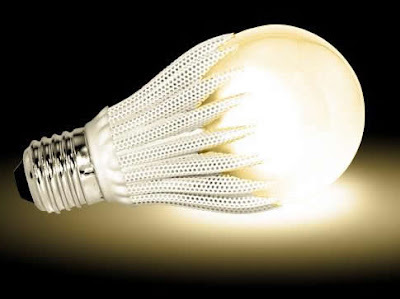 While incandescent bulbs rely upon a glowing filament for the production of light. The Light emitting diodes bulb on the other hand use all the energy to light up the lamp. Thus saving heat energy. The low cost of maintenance as well as longer shelf life makes this technology a better purchase. In America, where 20% of the energy is consumed in lighting, the LED has proven exceptionally efficient in saving a considerable portion of this energy. Another pioneer step that has rendered an extra edge to this technology is the option of replacement wherein an another bulb known as CRS MR 16 (produced by CRS Electronics), directly replaces fluorescent tubes without modification to the electrical lighting fixture. This linear tube bulb is also bedecked with the advantage of life expectancy that is beyond 40,000 hours. Another product under this segment is the CRS MR16, that too is capable of saving energy consumption up to 87%. The use of LED's today have not remained confined to home and office where they are known to illuminate the area. In the modern world, their worth is rapidly being realized in many medicinal applications as well. One such use is in the restorative dentistry where blue light emitting diodes are being used for the cure of light activated oral bio materials. In clinical trials conducted by the researchers, it came to notice that a blue light emitting diode (LED) light curing unit (LCU) is capable in the production of equal dental complex depth via a halogen LCU which is adjusted in a manner that gives an irradiance of 300 mWcm-2. LED lighting has a very colourful and unique characteristic that can be manipulated for beautification of landscapes, rooms, cars and any object worth beautifying. LED lighting can add colour and aura that make your homw looks cools. We are an well-established exhibition organizer in Guangzhou, China. Our featured exhibition is the "China (Guangzhou) International Hospitality Supplies & equipment fair (HOSFAIR)" . With the strong support from China Hotel Association, China Western Food Culture Association, Guangdong Cuisine Association, Guangdong Hotel General Manger Association and Guangdong Tourism Culture Association, the HOSFAIR has become one of the most influential exhibitions on hospitality supplies in China and keeps expanding year by year. Huazhan Department of Fair and Exhibition Co., Ltd. Guangzhou Chinas Exhibition Co., Ltd., a subsidiary of planning, and it is one of the main organizers of the leadership of the Chinese hotels. The contractors previous Xian hotel supplies exhibition is the largest brand in the western show and has a capacity of the Guangzhou Asian first-class international hotel supplies exhibition and procurement as high as the Friends of the international hotel network and 100 well-known domestic and foreign trade cooperation. Advertise The exhibition will continue to show the advantage of Huazhan to do outreach into the millions at home and abroad thousands of huge media (magazines, websites, newspapers, outdoor advertising, advertising signs) on advertisements, press releases, publicity and to maintain. The domestic in organization leader for hotel supplies manufacturers at home and abroad to expand the market to provide strong support. Guangdong, Shaanxi linkage Huazhan will make full use of the advantage of linking between Xian and Guangzhou companys strengths, innovation efforts and strengthen cooperation, set up in Guangzhou, Xian, hotel supplies exhibition platform for interaction, sharing of resources and speed up the ninth Xian hotel supplies exhibition to upgrade the national exhibition. Guangzhou in South China invitation of the wide range of hotel suppliers, agents, will focus on the invitation of South-East Asia and other international procurement, tours to promote the Xian International Exhibition of development. Compact fluorescent bulbs have been a trends for home decoration. The most largest advantages of them is energy saving. Adopted by householders as a longer-lasting, energy efficient alternative to the traditional incandescent lightbulb, compact fluorescents consume one-third of the power and last 1,000 times longer than incandescent bulbs. These compact fluorescent bulbs are four times more energy efficient than incandescent bulbs and provide the same lighting. - Use CFLs in all the portable table and floor lamps in your home. Consider carefully the size and fit of these systems when you select them. Some home fixtures may not accommodate some of the larger CFLs. - When shopping for new light fixtures, consider buying dedicated compact fluorescent fixtures with built-in ballasts that use pin-based replacement bulbs. 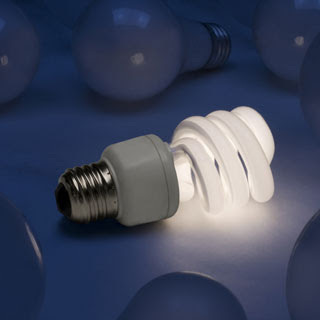 - For spot lighting, consider CFLs with reflectors. The lamps range in wattage from 13-watt to 32-watt and provide a very directed light using a reflector and lens system. - Take advantage of daylight by using light-colored, loose-weave curtains on your windows to allow daylight to penetrate the room while preserving privacy. Also, decorate with lighter colors that reflect daylight. So there are more and more family choosing CFLs. When you save on energy, you are also saving on your electricity bill and helping the environment. It is widely accepted that fluorescent light bulbs do, in fact, work longer than traditional light bulbs. Many people dislike the look of fluorescent bulbs, but you have to remember that the CFL bulbs are not the same that you see in some kitchens or when you go shopping. These are smaller—the size of a traditional bulb, so you don’t get that annoying overhead lighting. 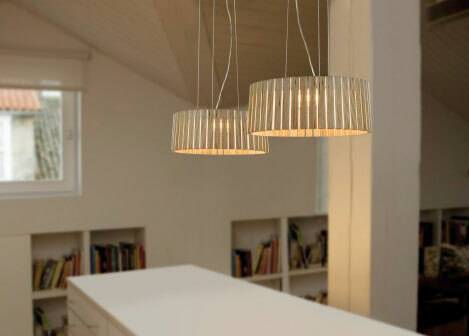 Task lighting is a kind of light that is used to illumination in certain areas of the room for specific tasks, such as reading, writing or playing a musical instrument. However, the illuminance level is not the only factor governing visibility. Contrast too is important, and a poorly positioned light source may cause contrast reduction, resulting in loss of visibility. Therefore, it can be argued that the most important purpose of task lighting is not increasing illuminance, but improving contrast. In addition, you need sufficient overall illumination so people can simply see where they're going, and so they don't trip over that great furniture that you have carefully placed in the rooms. 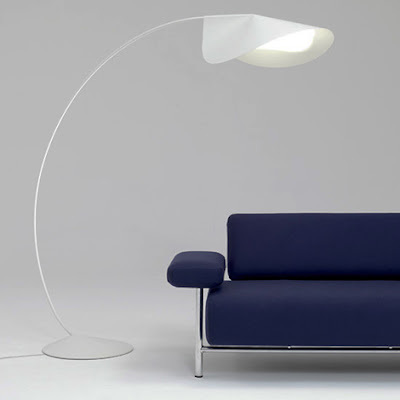 This general lighting is referred to as ambient lighting, which is the overall lighting that permeates the entire room. Of course, it's hard to separate the function of the lighting from the function of the room, and the two should work together. For example, if the function of a home study is to provide a place for reading, working on the computer, and sitting at a desk, you want to have lighting that will help with those functions; you'd want some kind of soft ambient lighting, with reading lamps strategically placed. In this techno savvy world everyone wants to own a device that is portable and compact in order to avoid any logistic. While travelling if you have an urge to read and cannot do so due to paucity of light, then LED Micro Task Lighting is just the thing you need. Due to its small size and various attributes like the unbreakable filament and extremely long hours of battery back up, LED Micro Task Lighting comes as a rescue for all those who need an extra lighting that can move with them. 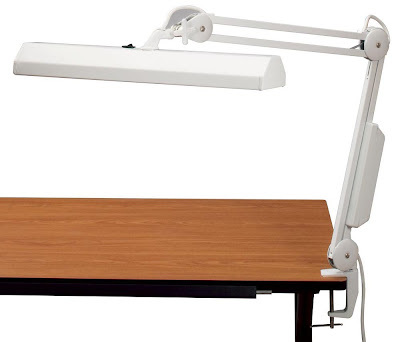 This handy LED lighting fixture does not involve waste of energy and has expendable arms and head to make sure that its rotates 360 degree, thus making you aim incisively where you want it across your page or keyboard. This products work on the methodology that involves 3 AAA batteries and four energy smart LEDs that help deliver a light that lasts for 1,00,000 hours. 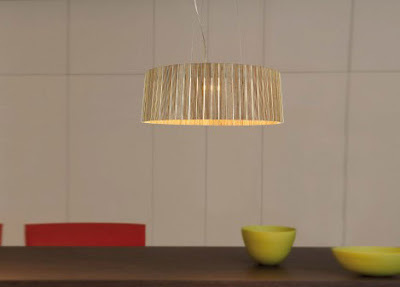 Contrary to traditional bulbs there are no filaments to break, so it does not need replacing, ever! A proper task lighting design will make your house look beautiful and humanistic.The actual task may range from very small up to about as far as you may reach with your hands or available tools. Lighting of larger areas is beyond the scope of task lighting.